Lenses are used to converge or diverge a light beam. Definition Lens that is thicker in the middle than at the edges will make parallel light rays converge to a point. Lens that is thinner in the middle than at the edges will make parallel light rays diverge. 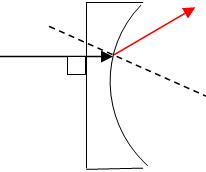 Terms Principal axis is the line passing symmetrically through the optical centre of the lens. Optical centre, C is the midway point between the lens’ surfaces on its principal axis. Rays passing through the optical centre are not deviated. Focal point, F is the point where all rays parallel to the principal axis converge after refraction by the lens. Focal point, F is the point where all rays parallel to the principal axis are brought to a focus in front of the lens. 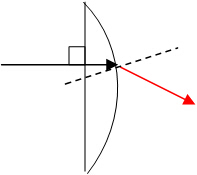 Focal length, f is the distance between the optical centre C and the focus point F.
Focal plane is the plane which passes through the focal point and is perpendicular to the principal axis. The thicker the lens, the shorter the focal length. The greater the refractive index of the lens, the shorter the focal length. The bigger the lens, the brighter the image. Move the slider on curvature radius, you should be able to observe the changes in focal length. Move the slider on refractive index, you should be able to observe the changes in focal length. Move the slider on diameter, you should be able to observe the brightness of the image (located on the right) changes. To know the reason why it is so, you can simply select "Many Rays" on the top left corner, and move the slider on diameter again. You will see when the diameter increases, the number of light rays passing through the lens and converge to form the image increases, and thus brighter. Therefore, the answer for a popular question on lens is the image becomes dimmer when the lens is cut into half. Any two of these three light rays will help us to locate the position of image. Step 1: Setting up the ray diagram by drawing principal axis and lens and marking out C and F.
Step 2: Placing the object on one side of lens (but usually on left side). Step 3: Draw any two special light rays (usually first and second) to locate the position of image, which is the intersection point, then draw the image. Note that all the light rays from object must intersect at one point which is the position of image. Of course, the light rays from the tip of object go to the tip of image while the tail of object goes to the tail of image. Ray 2 and 3 are special light rays used to locate the position of image. Once image is located, the rest of light rays (1, 4, 5) join themselves to the point of intersection to complete the ray diagrams. An animation on these ray diagrams can be found here. Or you can move around the object yourselves using the applet found above. Both give you the same result. When u ≤ f, image is always virtual and upright. To determine the size of image, we can treat u = 2f (image is same size) as a reference. u < 2f, image is magnified. => When the object is ﻿closer﻿ to the lens, the size of image is larger. Image formed by diverging lens is always virtual, upright and diminished. Note that when the object is closer to the lens, the size of image is larger. An animation on ray diagrams for different object distance can be found here.